This is the most stylish, stunning collar we have recently designed and is cut from the finest of leathers. 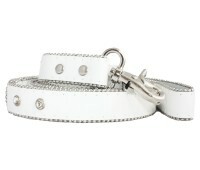 The collar has a crystal encrusted buckle, and the crystals are of Austrian origin and considered the best in the world!! Your Puchi will stand out from the crowd in one ofthese! !